VANCOUVER, BRITISH COLUMBIA--(Marketwired - April 18, 2017) - Skyharbour Resources Ltd. (TSX VENTURE:SYH)(OTCQB:SYHBF)(FRANKFURT:SC1P) (the "Company") is pleased to announce the closing of a non-brokered private placement for aggregate gross proceeds of just over CAD $2.1 million (the "Financing"). 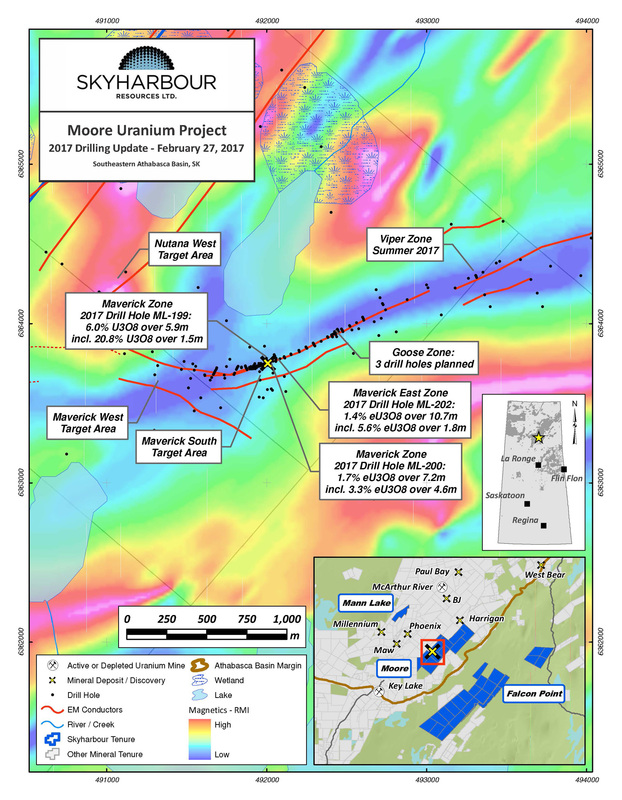 The Company now has over $3.7 million in the treasury and is fully funded for upcoming diamond drill programs at its flagship Moore Uranium project located on the southeast side of the Athabasca Basin proximal to regional infrastructure, as well as nearby development projects and producing mines. The Financing consisted of 2,452,660 flow-through shares of the Company (the "FT Shares") at a price of CAD $0.60 per FT Share as well as 1,258,000 units (the "Units") at a price of CAD $0.50 per Unit for combined total gross proceeds of CAD $2,100,596. Each Unit purchased will include one common share as well as one-half of a common share purchase warrant ("Warrant"). Each whole Warrant will entitle the holder to purchase one additional common share for two (2) years at a price of CAD $0.75 per common share. The company plans to use the proceeds to advance the Moore Uranium project through diamond drill programs planned for the summer of 2017 as well as the winter of 2018. Denison Mines Corp. ("Denison"), the Company's largest strategic shareholder, and a reporting insider, subscribed to 400,000 Units, as part of the Financing, for gross proceeds to the Company of $200,000. Accordingly, Denison has acquired an additional 400,000 common shares and 200,000 Warrants of the Company. In connection with the financing, Skyharbour issued a total of 125,922 warrants to finders (the "Finder's Warrants") who introduced certain subscribers to the private placement. Each Finder's Warrant will entitle the finder to purchase one additional common share for two (2) years at a price of CAD $0.75 per common share. The Company also paid to finders a total of CAD$85,248.30 in cash fees associated with this financing. The FT Shares, Units and Warrants issued under the private placement and any shares issued pursuant to the exercise of the Warrants and Finder's Warrants are subject to a four month and one day hold period under applicable securities laws and imposed by the TSX Venture Exchange. The Company's President and CEO, Jordan Trimble, stated: "We are pleased to close this financing with several new institutional investors as well as our largest strategic shareholder, Denison Mines, participating in the private placement. The Company is well positioned financially with over $3.7 million in its treasury to fund the planned and upcoming drill programs at its flagship Moore Uranium Project. Given the previously reported high grade drill results from our winter 2017 program, we are already planning a summer drill program as we await final geochemical assay results for the final ten drill holes. 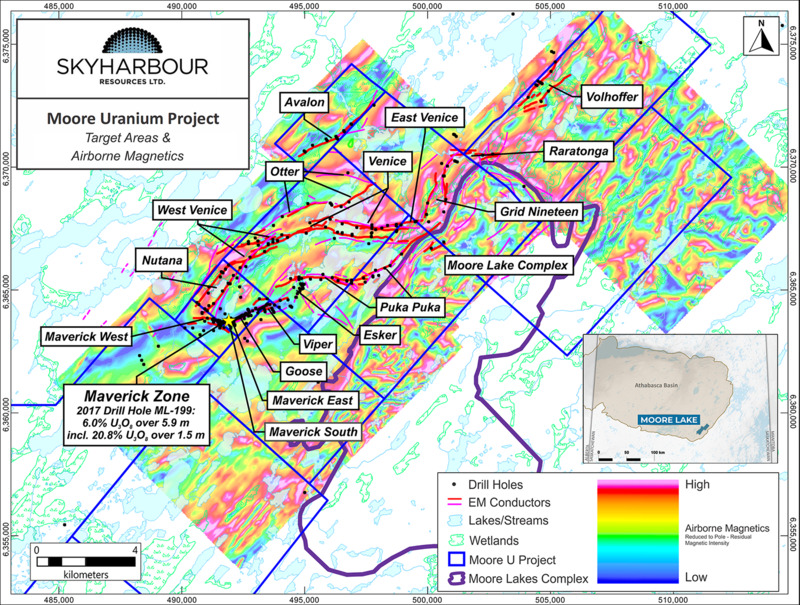 The Company will also benefit from news flow from upcoming exploration programs being planned with strategic partners AREVA Resources Canada and Azincourt at the Preston Uranium project, in addition to future cash payments from the partner companies to Skyharbour as per the respective option agreements. 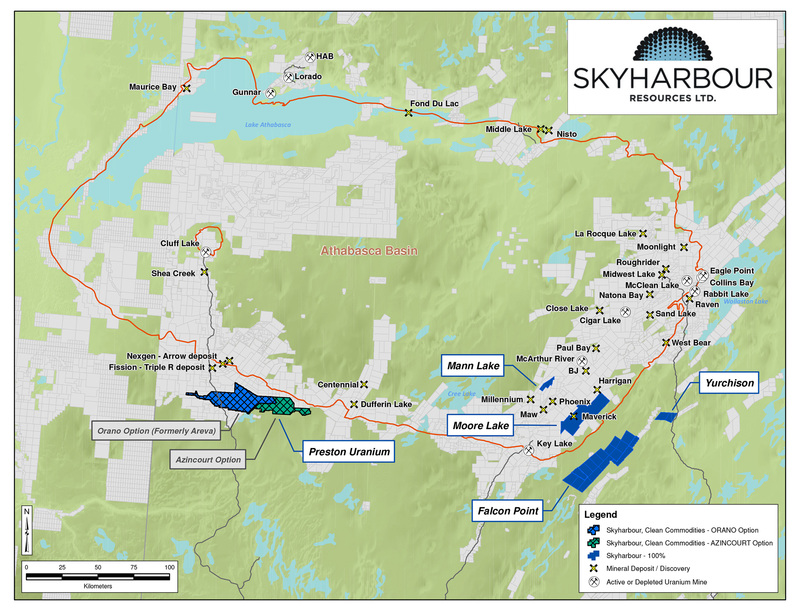 Skyharbour continues to execute on its business model by adding value to its project base in the Athabasca Basin through focused mineral exploration at its flagship Moore Uranium Project, as well as utilizing the prospect generator model to advance its other projects with strategic partners." 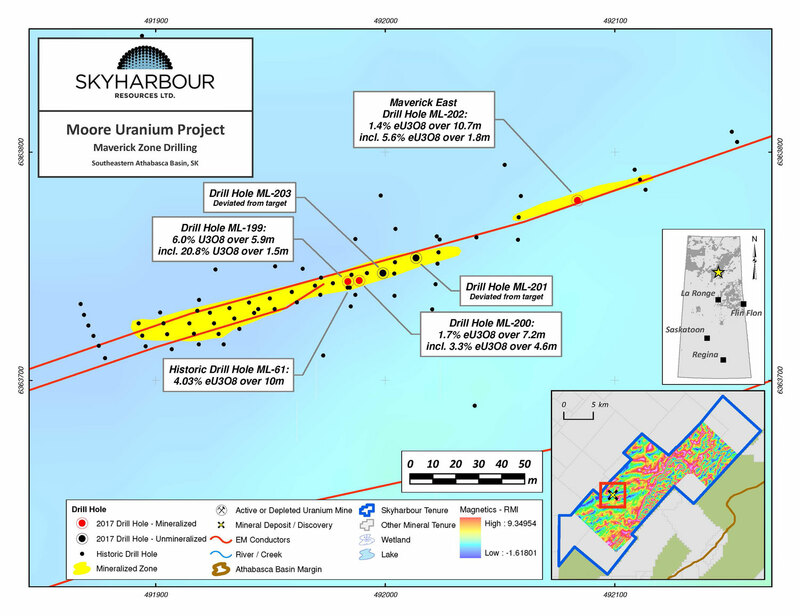 Skyharbour holds an extensive portfolio of uranium and thorium exploration projects in Canada's Athabasca Basin and is well positioned to benefit from improving uranium market fundamentals with five drill-ready projects. 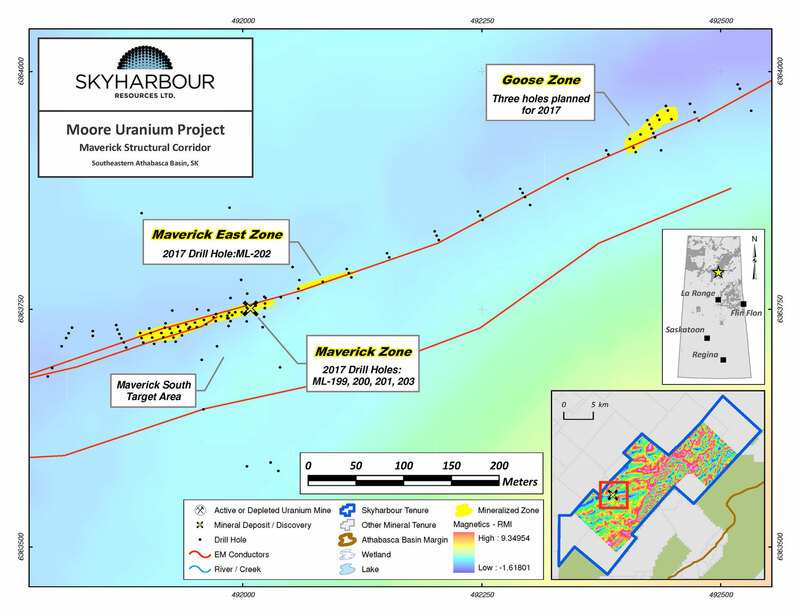 In July 2016, Skyharbour acquired an option from Denison Mines to acquire 100% of the Moore Uranium Project which is located 20 kilometres east of Denison's Wheeler River project and 39 kilometres south of Cameco's McArthur River mine. Moore is an advanced stage uranium exploration property with a high grade uranium zone known as the Maverick Zone returning drill results of up to 6.0% U3O8 over 5.9 metres including 20.8% U3O8 over 1.5 metres at a vertical depth of 265 metres. Skyharbour and its Preston Project partner Clean Commodities recently signed an option agreement with AREVA Resources Canada whereby AREVA can earn in 70% on the Preston Project through $8 million in project consideration. Preston is a large, geologically prospective property proximal to Fission Uranium's Triple R deposit as well as NexGen Energy's Arrow deposit. The Company also owns a 100% interest in the Falcon Point Uranium Project on the eastern perimeter of the Basin which contains an NI 43-101 inferred resource totaling 7.0 million pounds of U3O8 at 0.03% and 5.3 million pounds of ThO2 at 0.023%. The project also hosts a high grade surface showing with up to 68% U3O8 in grab samples from a massive pitchblende vein, the source of which has yet to be discovered. 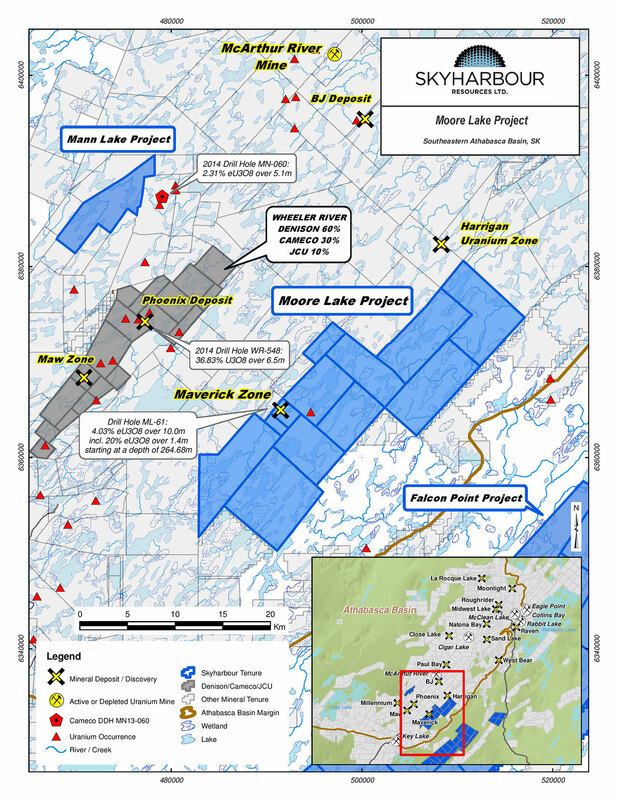 The Company's 100% owned Mann Lake Uranium project on the east side of the Basin is strategically located adjacent to the Mann Lake Joint Venture operated by Cameco, where high-grade uranium mineralization was recently discovered. Skyharbour's goal is to maximize shareholder value through new mineral discoveries, committed long-term partnerships, and the advancement of exploration projects in geopolitically favourable jurisdictions.